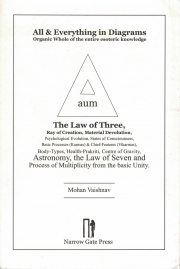 Description of "All & Everything in Diagrams"
This book presents Diagrams depicting possible levels of being and the workings of spiritual laws. All previous cultures have recognised levels of existence of which our unexamined life is almost the lowest. This book catalogues these other, higher levels according to the understanding of the Hindu and Fourth Way traditions. Mohan Vaishnav is an author, poet and corporate law professional based at Ahmedabad, Gujarat, India. Reviews of "All & Everything in Diagrams"